A beautifully chic introduction to the world! Let your baby do the talking with this stylish baby announcement card. 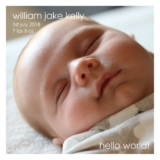 Personalise with your favourite photo and birth announcement details to make it your own!